Shade is a blessing and a curse where gardening is concerned. Here on the Gulf Coast, shade is a necessity for many gardeners. If it were not for the shade of our oaks and pecans, we would be unable to enjoy our yards for any form of recreation and gardening would be nearly impossible several months of the year. Gulf Coast gardeners must learn to find a balance in the amount of shade and sun in our landscapes. We have to reserve areas for full sun plants, plan shade to keep our homes and recreational areas comfortable, and then learn to garden in both conditions. One key to being successful with this balance is understanding shade. Many plants that are described as requiring full sun in other parts of the country are perfectly happy in light or part shade conditions here. The more we understand shade, the better we can manage it and the plants we wish to grow in those conditions. The rotation of the earth causes the quality and intensity of light to vary throughout the year. 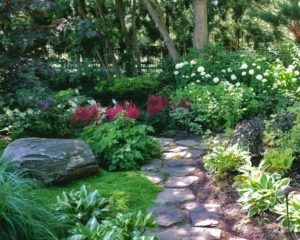 Knowing how light falls across your garden can help you compensate for seasonal light changes. The density of your tree canopy also makes a difference. Tall pine trees typically provide dappled or filtered light all year, whereas the light exposure under deciduous trees changes throughout the seasons. Not all shade comes from tree cover. There is shade to be found on the north side of structures, under eaves on the east side of structures, under deep overhangs, and under porches and patio covers. Light shade – Light shade is a permanent shade cast by the shadow of a building, wall, hedge, or tree on a site otherwise exposed to the sky and open to light. It offers the most opportunity for plants that otherwise like the sun. Dappled or filtered shade – Dappled or filtered shade is created by sunlight filtering through the canopy of open tree branches or through latticework structures, with the pattern of light shifting all day. This is probably the most common shade in suburban backyards and is also the most common woodland shade-garden environment. Deep or Full shade – Deep or full shade is the dense kind of shade found under evergreens or closely spaced shrubs and trees that do not allow any direct light to penetrate. This is the most cooling kind of shade but is also the most difficult; it takes effort to find plants that will bloom here. But it also can be the most interesting, because the plants suited to it tend to have the best leaf structure. There is another aspect of shade gardening that we need to consider – they type of soil in the shade zone. There are two basic types we hear about; dry shade and moist shade. Dry shade is found under large shade trees such as oaks or pecans. The tree roots use most of the available water and competition is fierce. Dry shade can also be found where you have deep overhangs or covers that prevent rainfall from reaching the soil. Dry shade is a challenge. Two of the most important elements in plant growth are light and water and dry shade affects both. Every action the gardener takes must take the health of the tree AND the intended under-planting into consideration – soil preparation, fertilizing, mulching, and irrigation must suit both. Soil preparation under trees should be minimal. Protect shallow tree roots at all cost. Do not till at all, and cultivate only shallowly. We want to do what I call “scratch cultivation” – hand tools or a power cultivator set at the shallowest depth. Removing grass under a large shade tree is generally pretty easy; it’s likely weaker than turf grown in full sun. The lazy gardener’s way to remove turf is to mow the turf at the lowest setting, establish a border, then mulch with 3” – 4” of premium native mulch. This is sufficient to kill St. Augustine turf. Let this rest for several weeks, and then remove any persistent weeds that pop through. When you get ready to plant, use the “pocket planting” approach. Scrape the mulch back from the spot, trowel in a couple of inches of leaf mold compost and a handful of fertilizer, set in the plant, firm the soil around the roots and replace the mulch. Water in with a root stimulator. Stick with 4” transplants so you never have to dig deeply enough to disturb the trees feeder roots. These small plants do not create any significant competition with the tree. They will use up the fertilizer you have added and any remainder will be used by the tree without any negative impact. You should never add soils, bed mix or compost over 1” – 2” deep under a tree in any one year. This affects air exchange and threatens the tree. Rough mulches and tree leaves are loose material with lots of air space and do not have this negative effect. The pocket planting method allows you to avoid this issue altogether in addition to minimizing bed prep and soil disturbance. Do not build raised planters under trees. Fibrous tree roots will fill planter quickly – the biggest plant always wins! They can also have a negative effect on the tree since a broad area would have more than the 1” – 2” maximum allowable cover. Moist shade is generally found on the north side of a structure or on the east side under standard overhangs. Limited sun exposure in these areas can prevent rainfall from evaporating completely between rain events. The major challenge in moist shade is soil health. These soils can become water-logged during wet spells. In general, plant roots do not thrive in water-logged soils. It’s not just about drainage; it’s about the pore spaces – the spaces where the roots seek air. Turf is usually not an issue in moist shade areas since it does not grow well in that environment in the first place. However, if you do have turf to remove, you can deal with in the same manner as described above for dry shade. Soil preparation in moist shade should be concentrated on improving tilth – the texture and makeup of the soil. Compost and expanded shale are good additions to begin to improve moist shade. If you want to prepare an entire bed, use 2” – 3” of each spaded deeply into the existing soil. You can also use the “pocket planting” method in moist shade areas. Work a big shovel each of compost and of expanded shale, and a handful of fertilizer into the pocket of soil before you plant. Water in with a root stimulator. As time passes, and you continue to plant in pockets, you will end up improving all of the soil in the area. Keeping a 2” – 3” layer of mulch or compost/mulch combo will also start a continual improvement program.